Posted on September 9, 2018. Filed under Association News. Be the first to comment. 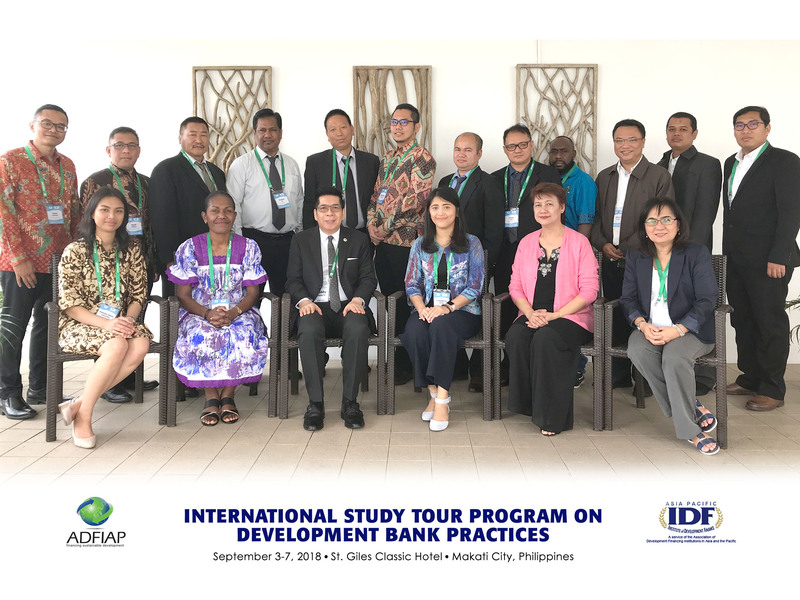 ADFIAP’s Asia-Pacific Institute of Development Finance (IDF) organized the “International Study Tour Program (STP) on Development Bank Practices” on September 3-7, 2018 in Manila, to share the best practices and experiences of Philippine-based ADFIAP member-DFIs to the sixteen (16) participants from members in Bhutan, Fiji, Indonesia, Vanuatu, and the Philippines. ADFIAP Secretary General, Mr. Octavio B. Peralta, welcomed the participants and presented an overview on development banking principles, history and rationale for development banks, emerging models, and differences between development and commercial banking, while ADFIAP Consulting Head, Ms. Cora Conde, made a presentation on development lending practices. The subsequent sessions of the STP included institutional and project visits to the Development Bank of the Philippines (DBP), Philippine Export-Import Agency (PhilExim), Home Development Mutual Fund (Pag-IBIG Fund), and Small Business Corporation (SBC). During the institutional visits the participants were able to learn first-hand the role of Philippine DFIs in sustainable development of the country, their strategic directions, lending programs, activities in infrastructure financing, social projects, logistics, and environment as well as in the MSME sector. The DFI financially-assisted projects that were visited included the Steel Asia and Maynilad Water Services, Inc., where they learned the role of these enterprises in national development. Steel Asia is the flagship steel company of the Philippines, serving the country with two million tons of rebar per year, while Maynilad Water Services, Inc., also known as Maynilad, is the water and wastewater services provider of cities and municipalities that form the West Zone of the Greater Metro Manila Area in the Philippines. For more details of this STP, please email the ADFIAP Secretariat at inquiries@adfiap.org.